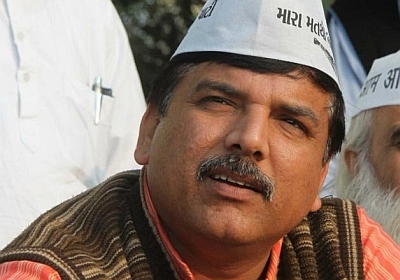 With the Aam Aadmi Party under fire over the farmer suicide incident, its leader Sanjay Singh on Friday met the family of the deceased, Gajendra Singh, in Dausa and told them that the Delhi government would consider their demands, including for martyr's status for the farmer and a government job for his kin. The AAP leader handed over a cheque of Rs 10 lakh as compensation to the farmer's family and also showed them a video clip in support of the party's claim that AAP leaders were not responsible for the incident. An AAP spokesperson later said that Delhi Chief Minister Arvind Kejriwal had spoken over the telephone to the family of the deceased farmer. Sanjay Singh told reporters at Nangal Jhamarwada village in Dausa district of Rajasthan that Gajendra Singh's family has made two demands -- martyr's status for the deceased farmer and a government job to his kin. "I will speak to Kejriwal about the demands and I am sure that Delhi government will take a positive decision," Sanjay Singh said at the residence of the farmer who hung himself at an AAP rally in Delhi on Wednesday. "I met the daughter, sons, mother, father and other family members of Gajendra Singh and explained to them the situation on that day. It is unfortunate that he is not among us today and his family members are under severe distress," he said. Gajendra Singh's uncle Gopal Singh and brother Vijendra said that Sanjay Singh had handed them a cheque for Rs 10 lakh, which had been accepted. "He (Sanjay Singh) also showed us a clip on a mobile phone in which the AAP leaders do not appear to be responsible for what happened with Gajendra. We are convinced by him. However, our demand for a CBI inquiry into the matter still stands," Gopal Singh said. Vijendra said that Sanjay Singh had told them that he was sorry about the incident. On the other hand, Gajendra Singh's father, Banne Singh, said that nothing can satisfy him. Reacting to Kejriwal's apology over the tragedy, he said, "I have lost my young son. Can any apology or any other move satisfy me as a father? Despite being a politician of such a stature he wants to suffice with a mere apology. We welcome that Sanjay Singh came and shared our grief." Sanjay Singh said, "We presented our side before them (Gajendra Singh's family) and narrated the incident. We told them that we tried to do every possible thing to save him, but could not."